The Newport Ship is the most important late-medieval merchant vessel yet recovered. Built c. 1450 in northern Spain, she foundered at Newport twenty years later while undergoing repairs. Since her discovery in 2002, further investigations have transformed historians’ understanding of fifteenth-century ship technology. This cutting-edge conference brought together maritime archaeologists and historians to explore the ship, consider her significance, and locate the vessel within the commercial world from which she came. The conference took place in the Arts Faculty (Lecture Theatre 3) of the University of Bristol, 17 Woodland Rd, over two days. It consisted of eight sessions with papers by invited experts in the field and a capacity audience of c.105 people. We started by examining the ship herself and then moved outwards in a series of broadening rings to investigate the wider context of the vessel. Our investigation began with Newport and The Severn Sea (Môr Hafren), as the Bristol Channel was more normally known in this period. From there, we moved on to explore the wider commercial and political networks of England, the Basque Country, Portugal and the Mediterranean. A copy of the conference flyer (PDF, 495kB) (illustrated below) is available as a pdf (500k). At the end of the conference it was agreed that we should produce a volume based on the proceedings, subject to the securing of sufficient funding. There are three main reasons this seemed worthwhile. First, and most importantly, the publication will provide a set of studies that can help to create an interpretive framework for the future understanding of this important ship. Second, it was recognised that such a volume will be able to offer a set of valuable investigations into the the maritime world of the fifteenth century, which offer a concentration of study rarely found elsewhere. Third, the volume will serve to showcase the innovative approaches being taken by maritime historians and archaeologists of this period, revealing, in particular, how fruitful it can be when they work in collaboration to investigate the shipping and trade of the pre-modern era. In January 2015, Dr Evan Jones, the conference organiser, received a generous donation of c.£13,000 from Gretchen Bauta, a private Canadian benefactor, to facilitate the publication of both the conference volume and a set of fifteenth-century Bristol 'particular' customs accounts. The latter record the international trade and shipping of the Severn Sea in great detail, with many of the papers presented at the conference making use of draft transcriptions of the customs accounts created by the Cabot Project. The customs accounts volume will be published by the Bristol Record Society. Having secured this funding, we were able to press ahead with publication. In February 2015 we received formal support for the publication of the conference volume from HRH the Prince of Wales in recognition of the signficance of the vessel and its importance to the people of South Wales. He has provided a foreword for the volume, which will be published with it. The book is to be published by University of Wales Press in June 2018. Harbour cruises on the Matthew of Bristol, 18.00-19.00 and 19.00-20.00, the first of which was paid for by the Matthew of Bristol Trust. About 60 people took part in the cruises. Session 4:16.00-17.30: Roundtable discussion consisting of all the speakers and with questions and comments from the audience. Dr Rowena Archer, 'The World of the Newport Ship 17th-18 July 2014'. Delegate review (PDF, 13kB). Iago Irixoa, 'The World of the Newport Ship'. Delegate review in Spanish and Basque. 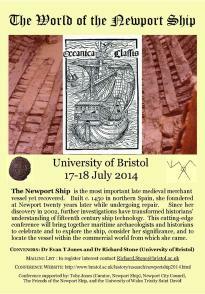 'The Bristol Conference', Friends of the Newport Ship, News: July 2014. Provisional report. Dr Evan Jones and Dr Richard Stone (University of Bristol) with support from Toby Jones (Newport Ship) and Nigel Nayling (University of Wales: Trinity Saint David). The Cabot Project, funded by Gretchen Bauta.